Background: There is no curative treatment for Alzheimer’s disease (AD). Ginseng is widely used in the treatment of AD in Asian countries. Objective: To evaluate the effectiveness and safety of ginseng for AD. Methods: We searched seven main databases for randomized clinical trials (RCTs) on ginseng for AD from their inception to December 2014. The Cochrane risk of bias tool was used to assess the methodological quality. We used RevMan 5.2 to synthesize the results. Results: Four RCTs involving 259 participants were identified for this systematic review. The methodological quality of included studies was not promising. All comparisons were made between combined treatment (ginseng plus conventional treatment) versus conventional treatment. The results of meta-analyses and several individual studies showed that the effectiveness of combined treatment was inconsistent as measured by MMSE, ADAS-cog, ADAS-noncog, and CDR. No studies reported the outcomes of quality of life (QoL). The current data did not report serious adverse events. Conclusion: This review showed that the effects of ginseng on AD were still inconclusive. The main limitations of the available studies were small sample sizes, poor methodological qualities and no placebo controls. Larger, well-designed studies are needed to test the effect of ginseng on AD in the future. 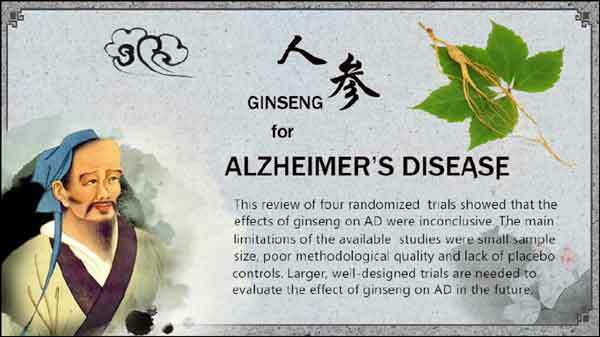 Alzheimer’s disease, Ginseng, Ginsenoside, Meta-analysis, Randomized controlled trial, Systematic review. Center for Evidence-Based Chinese Medicine, Beijing University of Chinese Medicine, Beijing 100029, China.